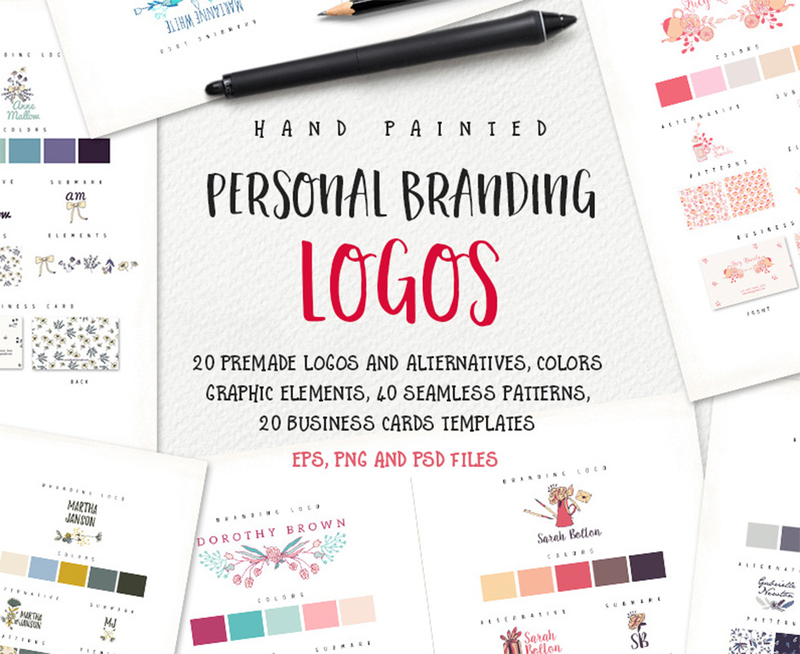 Get Creative With These Personal Branding Logos: 20 Packs + more! I present my Personal Branding Logos Kit, which is perfect to use with Adobe Illustrator and Photoshop. Ignite your branding imagination with these floral logo kits. • Logo design with two alternatives provided in .EPS format. • In total there are 20 logos and 20 alternatives + 20 (submarks) individual pre-made logos and 20 color compositions for your inspiration. • 40 patterns and 20 business cards, as well as hand painted graphic elements are also supplied. • Only free fonts have been used (links provided) but please feel free to change them. I hope you will like it! Software compatibility: Adobe Photoshop and Illustrator CS6 or newer. .EPS files will work with a variety of programs such as Adobe Photoshop or Illustrator, Sketch, InkScape, Affinity, Corel Draw, etc. .JPG and .PNG files will work with most graphic software. This product has not been featured in a past deal. 20 logos and 20 alternatives + 20 (submarks) individual pre-made logos. 20 color compositions for your inspiration. Only free fonts have been used. File size is approx 428.5MB (652MB unzipped), offered as a single download.